The mass of a galaxy cluster distorts the fabric of space, changing the path of light that passes through it..
Light does not always travel in straight lines. Einstein predicted in his Theory of General Relativity that massive objects will deform the fabric of space itself. When light passes one of these objects, such as a cluster of galaxies, its path is changed slightly. This effect, called gravitational lensing, is only visible in rare cases and only the best telescopes can observe the related phenomena. Hubble's sensitivity and high resolution allow it to see faint and distant gravitational lenses that cannot be detected with ground-based telescopes whose images are blurred by the Earth's atmosphere. The gravitational lensing results in multiple images of the original galaxy each with a characteristically distorted banana-like shape or even into rings. Galaxy cluster Abell 383 is a gravitational lens. Hubble was the first telescope to resolve details within these multiple banana-shaped arcs. Its sharp vision can reveal the shape and internal structure of the lensed background galaxies directly and in this way one can easily match the different arcs coming from the same background object — be it a galaxy or even a supernova —by eye. Since the amount of lensing depends on the total mass of the cluster, gravitational lensing can be used to ‘weigh’ clusters. This has considerably improved our understanding of the distribution of the ‘hidden’ dark matter in galaxy clusters and hence in the Universe as a whole. The effect of gravitational lensing also allowed a first step towards revealing the mystery of the dark energy. 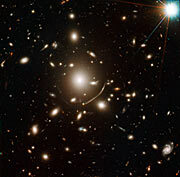 The article on the composition of the Universe has more details on Hubble’s work on dark matter. "When we first observed the galaxy cluster Abell 2218 with Hubble in 1995 we mainly aimed at studying the cluster and its galaxies. But we got a surprise. The images showed dozens and dozens of gravitationally lensed arcs. When we showed these ultrasharp images to our colleagues they could immediately see the importance of using gravitational lensing as a cosmological tool."